I’m excited to post one of the entries from our Ghost Stories Blog Contest. This one was sent to us by Sarah. About five years ago my husband and I decided to participate in a guided tour at the Winchester Mystery House in San Jose, California. Little did we know that a walk through the historical mansion would quickly become one of our most memorable ghostly adventures to date and one of our most requested stories to share among friends. For anyone unfamiliar with the Winchester, it was the primary residence of Sarah Winchester, widow of famous gun magnet William Winchester. Sarah was deeply distraught over the unrelated deaths of her daughter and husband. As a result, she sought help from a psychic who confirmed that the souls of people who had died because of the Winchester rifle must be appeased. Sarah was instructed to provide continuous construction in an effort to keep the spirits at bay. 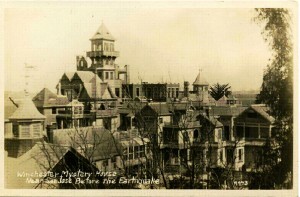 Building lasted for more than 38 years until Sarah’s death in 1922. Now, back to our story. On the guided tour, my husband and I were part of a very small group of people, less than 10 total. When we arrived at the ‘13th bathroom’ my husband and I lingered for a moment to observe the area. Quite unexpectedly, I felt a finger tap me on my shoulder and voice murmur something inaudible near my ear. My husband who was standing nearby saw the startled look on my face and approached me to see what was wrong. That’s when I told him that I believed Sarah Winchester didn’t approve of us looking in on her private shower and bath. Definitely one of our more frightening moments. It hasn’t deterred us from wanting to go back to the Winchester or from enjoying tours at other historical haunted hotspots.